When I was little, I used to go to the grocery store with my mom. I have a terrible memory, but it was either Safeway, King Soopers, or maybe even both. Anyway, when we passed the bakery, I often got to choose a cookie. The bakery ladies were so nice and would hand me my choice in a crisp paper wrapper. Do they still do that anywhere? My favorite cookie was a sweet cherry chip cookie. It was just the right combination of crisp and chewy, and I loved the flavor. The fact that it was pink probably didn't hurt either! 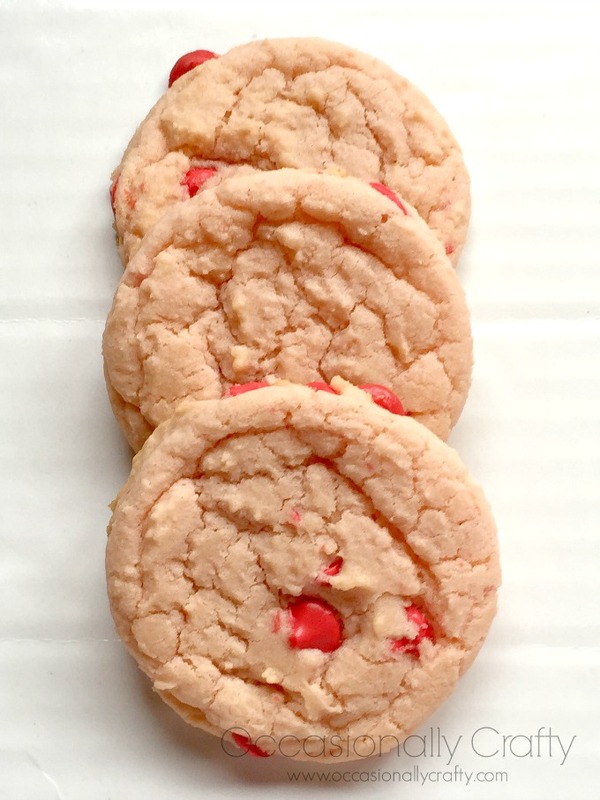 Today's recipe is an attempt to recreate this delicious cookie from my childhood. It's so easy to make, and is absolutely delicious! 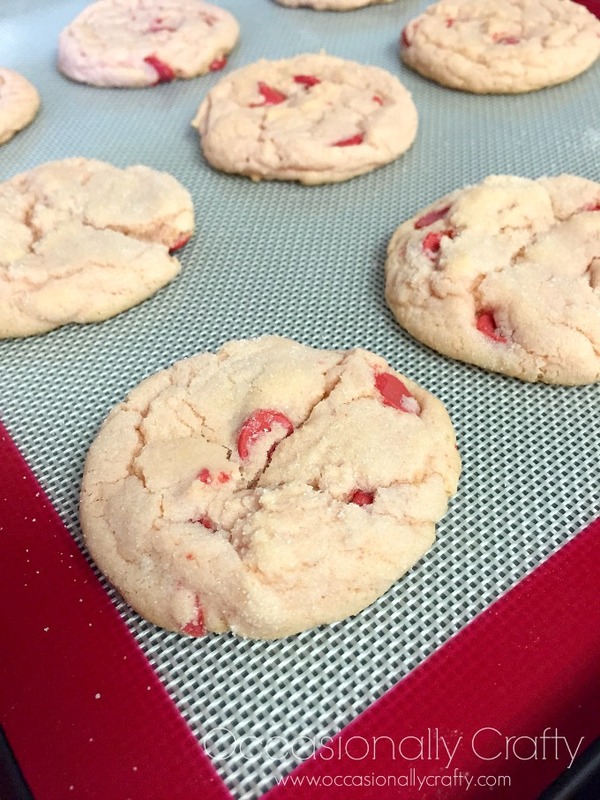 Again- it has a crisp crust but a delightfully chewy center- just how I like my cookies! These would be perfect to whip up for a Valentine's Day party, or just to enjoy with your family. My boys were raving over them! PS- somehow the cookies don't look very pink in the pictures- but they are! Cherry Chip Sugar Cookies Click here for a printable recipe Ingredients: 1 cup butter or margarine, softened 1 1/2 cups white sugar (+2 TBSP, separated) 1 egg 1 tsp vanilla extract 1 tsp almond extract Red food coloring 2 3/4 cups all-purpose flour 1 tsp baking soda 1/2 tsp baking powder 2 cups cherry baking chips Directions: 1. Preheat oven to 350 degrees F. In a large bowl, cream together the butter and sugar until smooth. 2. Beat in egg and the extracts. 3. In a separate bowl, stir together flour, baking soda, and baking powder. 4. Gradually blend the dry ingredients into the wet ingredients. Add food coloring until desired color is reached. 5. Roll rounded teaspoonfuls of dough into balls. Roll balls into 2 TBSP of sugar until well coated. Place on greased cookie sheets. 6. Bake 10-12 minutes in the preheated oven. Let stand on cookie sheet for two minutes (cookies will flatten/crinkle slightly). Remove to wire racks and cool completely. Best served fresh! This recipe makes about 32-36 cookies. This post may be linked up to the following parties- check them out with me! They are delicious- my daughter loves all things pink too! I love the flavor of cherry in desserts...these look wonderful! What would I do with all these delicious cookies?! Eat them all! Just kidding- I love to give them to friends. Oh, oh, I think I know what I am going to be baking this Valentine's dayyyy! Let me know how they turn out for you! Thanks for stopping by! So pretty! 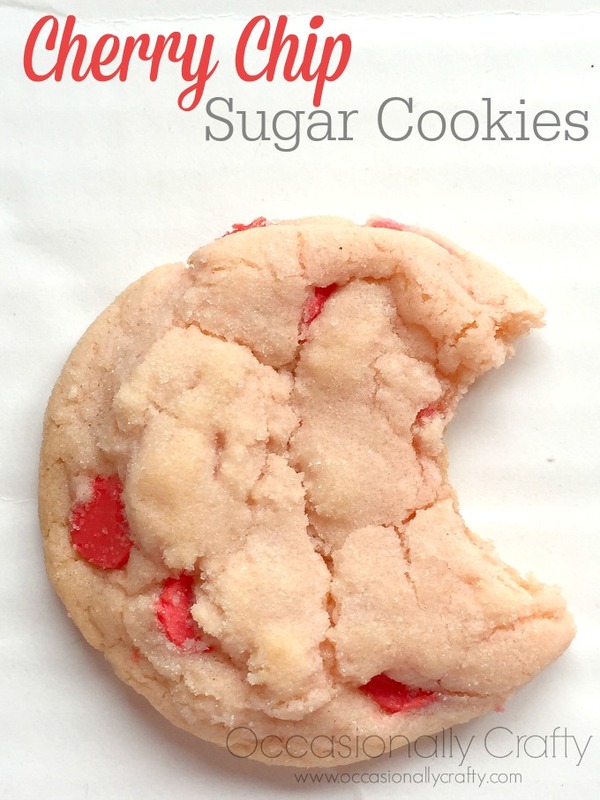 What a perfect valentine's day cookie. Those look truly scrumptious, and I know my family would love! I'm sure they would- my family devoured them! My mouth is seriously watering here. They look so delicious!! I would never have thought to use Cherry! How clever! Looks delish, too! I don't use it often, but it so yummy! Thanks stopping by! These are so cute and a little outside the box from the traditional Vday treats. Do you mind if I share on my page? I do a weekly roundup of things I love and I'm planning to do a special Valentine's Day feature. Thanks! You are welcome to share with a link back! I appreciate it! I am loving this recipe. So have to try it out! I would love it if you joined and contribute your awesome posts at my link party at City of Creative Dreams, starts on Fridays at 9AM eastern time and runs until Wednesday night. :D Hope to see you there at City of Creative Dreams Link Party.